CONNEX Spring Bushings, made of high grade spring steel, have been used for years by a variety of manufacturers in industries such as farming, construction, mining, forestry and many others. When used in conjunction with hardened shafts or bolts, CONNEX spring bushings are suitable for high pressure pivot points where oscillating or slow rotational motion occurs under extreme conditions and high specific bearing pressure. Often, spring bushings replace hardened solid bushings for economical reasons. They are easy to fit and avoid harmful stresses in the component. 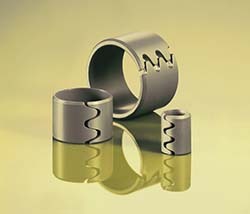 Where noise reduction is a consideration, CONNEX Spring Bushings with grease grooves and holes are increasingly requested. Lubrication and higher precision will increase the bearing life. In many applications, the seating capacity is a dominant factor. It is important that the tolerance of the housing bore meet the requirements of our standards. 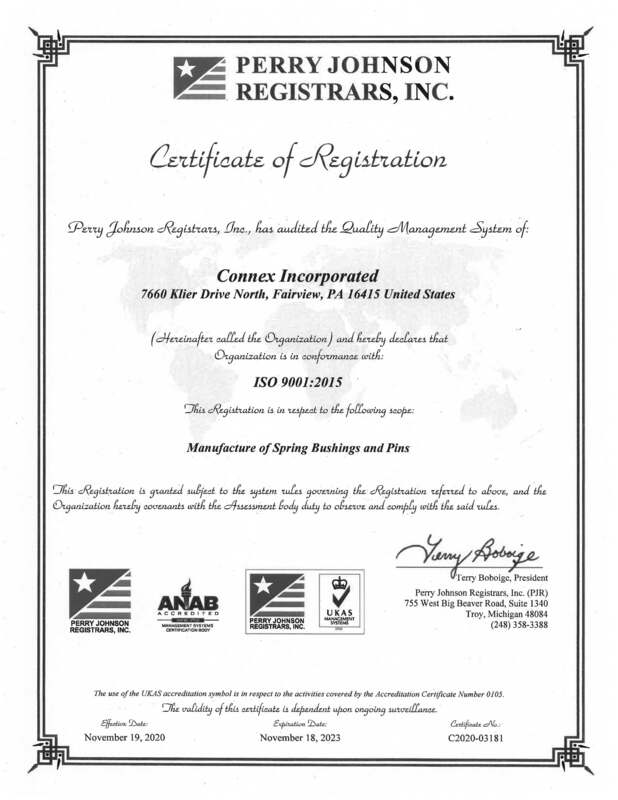 Please contact a CONNEX representative for recommended housing diameters. When higher seating capacity is needed, special measures may be incorporated in manufacturing. These must be agreed to by the customer in advance. High bearing loads require suitable materials for both bushing and shaft. Suitable shaft materials are AISI 1045 (fg), 4140, 5060, 8620 or other case hardening steels, which can be hardened to a depth of .023 to .030 at Rockwell C 55 to 60. This depth of hardness must be maintained if grinding is to be performed on the shaft. The shaft hardness is an important consideration for component safety and any wear could have an adverse effect on the load carrying capacity. Because the CONNEX Spring Bushing is normally designed as a wear part, it has the additional advantage of being easily replaced.